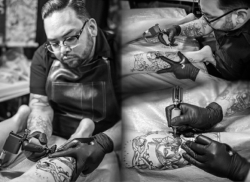 David Palacios has been in the tattoo industry for 11 years. Creating art since childhood, David developed his skills with the use of many different mediums. He has been a student of the arts for most of his life, even taking college art classes while in elementary school. In 2005 David was introduced to the tattoo world and worked under Johnny Quintana at The Ink Shop in Ontario, CA. for his apprenticeship. Tattooing came as natural as his artwork and shops became flooded for his work. David creates the best custom work in the area thanks to his complete understanding of the arts. But you must see his work to really understand this talent.